Nov 20, 2016 -- Living Wage Waterloo Region (LWWR) launched its Employer Recognition Program on Tuesday November 4th, commending ten local companies for their progressive wage schemes. LWWR is a local initiative to calculate a living wage for our region and to lobby employers to adapt their pay scales accordingly. The living wage for our region of $16 per hour was determined with the help of the Canadian Center for Policy Alternatives. It’s based on the needs of a typical family of four, with two parents working full time hours. 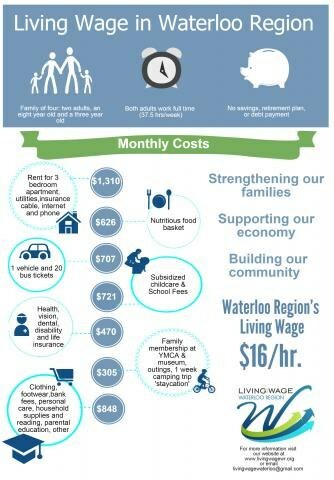 Calculated using actual costs for public transit, childcare and rent in the Region of Waterloo, the wage is the minimal amount needed for a family to live a comfortable life. The LWWR groups participating employers into one of 5 tiers; “friends” of the program commit to examining their pay scales within a year, “supporters” pay all their full time employees a living wage, “partners” pay their part time employees that living wage as well, “leaders” add contractors or students to the list, while living wage “champions” provide all direct and indirect employees a living wage. Three living wage champions were celebrated at the launch, including Enviro-Stewards Inc., GCP Industrial Products Inc. and the Social Planning Council of Cambridge and North Dumfries. “Living wage and minimum wage discussions can be complementary. A small act that you do on a living wage file might have a ripple effect on a minimum wage file and what we expect there” said CCPA Ontario director Trish Hennessy who spoke at the launch. Hennessy congratulated Waterloo region for joining living wage campaigns across Ontario explaining that besides the obvious benefit for employees, this campaign sets a tone for other discussions. There is also the fear that the program won’t attract larger employers, who typically have more employees being paid less than a living wage. deGroot-Mangetti hopes living wage employers will help advance the cause beyond their own workplace. “The whole aim is to reach out to those sectors of the economy where jobs tend to be lower paid. So one of the things we ask of our employers is to champion the living wage concept, to build it into contracts for bank services, food services, and security services."